I don't exactly hate FerreroRocher, but I am supposed to. I realized this when a friend of mine stuffed it into my mouth and I spat it out, immediately. And sometimes, who doesn't want to buy for herself a pack of those delicious balls of chocolate? But I stop myself, because I hate them. Rather I avoid them like poison ivy. Rewound to a few hours, I was slouching on the couch, of some obscure coffee shop, on the lesser known by lanes of the town, my hilly town. I was looking at the colors on the walls and on the roof, and at the crystal lights, talking to a friend, who was worried her life is so perfect, touch-wood. We were peeling off the wrappers of chocolates, and I was reminded that I hatred. 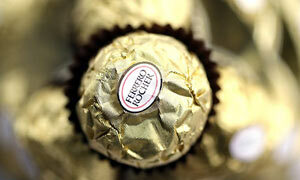 Rewound a few years, FerreroRocher was a gift from him. Three balls, wrapped in golden foil, placed in a box shaped like a heart. When he placed them in my hands, my joy was unbounded, unimaginable. I was grinning so much, my mouth hurt. Then on, began the first date. Smiles, mindless conversations, crazy questions, lousy answers, endless giggles, laughing like I would fall off the chair. We discussed the paintings on the walls of the restaurant, the color code. I had no time to look anywhere else but him. But whenever I did, I caught the popping eye balls of people, obviously they weren't popping enough, I just felt so, we always do. I was so nervous, from inside my heart was trembling, I wanted this thing to go on, I didn't want it to a die a premature death, or even a mature one. We always do, things like that. Don't we? I put my keys and my cellphone and my wallet on the table. But the FerreroRocher, on the couch beside me, I wanted to hold it close to me. I remember even clutching it for sometime. Then I got so engrossed in the conversation, I forgot about the chocolates, and left them behind on my way back. After he dropped me home, like I was like dying to narrate every single thing that happened, to whoever. In the process I realized the blunder. My FerreroRocher was left behind, duh. In one breath, I ran back to the restaurant and almost begged the waitress if she had seen it lying on the table. She took it out from her drawer and handed it over to me. And I can still remember the broad smile that covered her face that moment. We both knew what it meant. I had pressed its golden foil between the pages of my diary, like it was some treasure. So that was it. The story ended a few days after that. And that's exactly why I hate FerreroRocher so much. I try my best to..
u write really well.i visit yr blog for one more reason-u echo at times the feelings i have been thru and still am going thru. ". I was so nervous, from inside my heart was trembling, I wanted this thing to go on, I didn't want it to a die a premature death, or even a mature one."